Hotel Mediterraneo faces two very quiet streets and in spite of being at the center of Palermo, it isn’t reached by the traffic noise. The entrance is in Via Rosolino Pilo, a side street of Via Ruggiero Settimo, the most elegant street of the City. 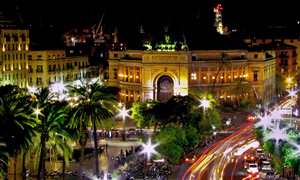 The Hotel is located between Teatro Massimoand Piazza Politeama, prestigious European theatres, nearby the shoppingstreets, the harbour and the terminal bus from/for the airport. 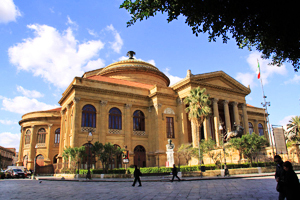 Hotel Mediterraneo enjoys a central position, allowing you to easily reach the main tourist attractions of Palermo. The area is full of restaurants, bars and shops. The hotel offers 104 rooms, all with private bathroom, and a residence with 20 apartments. Hotel Mediterraneo offers also a bar with room service and 3 large meeting rooms. 24h Private car park available (until all space is taken, not bookable).. Send us a message with your desired room type, arrival date and number of nights you would like to reserve. We’ll contact you in no time.